It’s never too early to start thinking about building a resume for after college. In fact, the college graduates that get the best jobs are the ones that are networking right now, applying for the jobs early, and interviewing in the Spring. To make that happen, you need to consistently keep an up-to-date resume. This doesn’t just apply for recent college graduates. Maintaining an updated resume template is essential for all ages of workers, because you never know when that amazing opportunity is going to strike. You could be having coffee with an acquaintance and get offered to apply for an amazing job. Or you could be unexpectedly laid off, and have to start a job search. If you have an updated professional resume, it’s easier to handle these situations. But here comes the hard part – putting together an amazing resume that will sell your skills. Even if you update your resume often (think every 6 months), do you still have an amazing resume that catches a recruiters attention? Or do you just have a run of the mill, “average” resume that recruiters are going to pass over? I’ve seen over 1,000 resumes of recent college graduates, and the sad truth is there are more bad than good. But that works in your favor if you create something awesome. The truth is, I would have sent him the online application after he sent over his resume. But the fact that this shocked him put me off a bit. 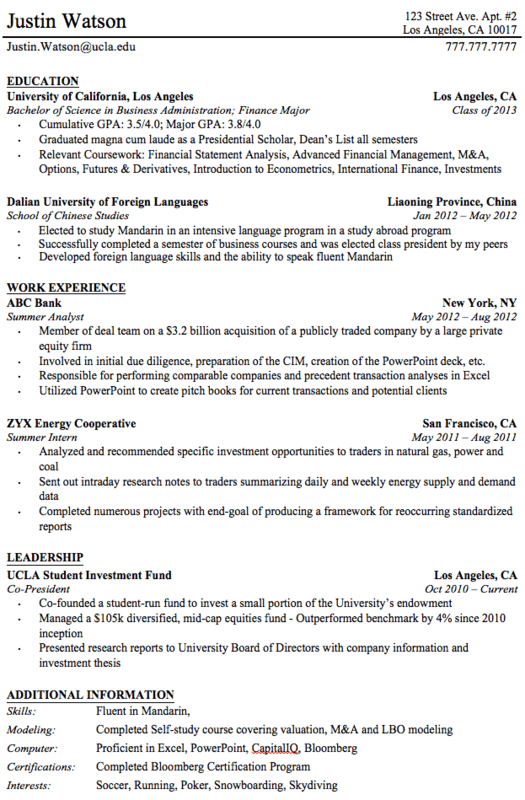 I simply asked myself, “Does this college student think resumes don’t matter anymore?” How wrong could he be. A resume will make or break your job application. 1. Keep It Short And Simple: Employers looking at resumes are typically going through a bunch at once. Keep your resume to one page if possible. When I say “if possible” – I mean that 98% of the time you should have a resume that is less than one page, and only under very specific circumstances should you go longer than that. Along the same lines, keep your sentences and paragraphs short. This isn’t a biography. That’s what an interview is for. Keep it high level and quickly digestible. 2. Check And Double Check: Typo? Never on a resume. Grammar issues? No. You need to check, then double check, then triple check your resume. Once you do that, have 2-3 other people read it for you as well. Never have mistakes on your resume. 3. Content Matters Most: Focus on your content, not on your design. In fact, don’t get crazy on your fonts, colors, or any of that stuff. Instead, make sure that your job descriptions make sense (to someone who may not know what “Chief Widget Maker” means), and that you have concrete examples of what you did at each employer. 4. Customize Your Resume For Each Job: Don’t change your entire resume, but make sure that you do change it up to match the job description of the job you’re applying for. The best tip here is to look for words used in the job description, and incorporate them into your resume where it make sense. For example, if your resume says “worked with spreadsheets for a project”, but the job description specifically references Excel, change your resume to “worked with Excel spreadsheets”. 5. Stand Out, But Don’t: Your resume does need to stand out, but at the same time you don’t want to be “that guy”. I recommend printing your resume on high quality paper, making sure that you make good use of bold and italics on your page. Also, consider putting a professional profile picture of yourself on your resume. Crazy? Well, it will catch the recruiters attention, and it will make you more memorable when it comes to actually interviewing in person. Or if you met them at a job fair, they may connect the picture better to the resume. Win-win. 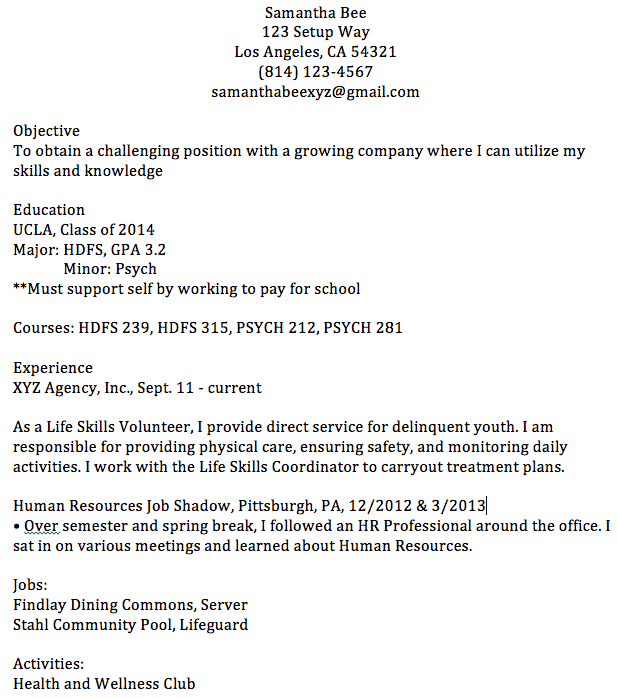 Yes, that is really a resume we received. I changed the name and location, as well as several other facts, but this happened. Missing punctuation in Objective sentence. For the human resources job, it doesn’t say anything valuable that was done or learned. Overall, I would have tossed this resume after the education section, if it didn’t make for such a good example of what not to do. Always create a master resume that lists everything you’ve done. Once you create this master resume, tailor it to each job you apply for. Each tailored copy of your resume should be saved as a separate file – for example JustinWatson_Goldman_PositionNumber.doc. What this does is allow you to keep track of your resumes, as well as what position you applied to them for. Only use: Times Roman, Arial, or Courier Fonts. Older systems may not be able to read resumes in other fonts. When tailoring your resume, use keywords from the job description. I suggest using a site like Wordle.net to simply copy and paste the job description into. Then, it will create a word cloud that will show the most important terms. Use these in your resume. I put together a special package for the job seekers that want a leg up on the competition. 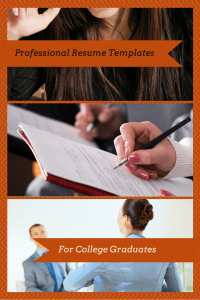 I’ve compiled a package of 7 professional resume templates (including the word document of the resume above) and 2 cover letters that have landed amazing jobs. These templates work, and you can simply change your information to make it personal for you. Buy These ResumesCongratulations on taking the quick step to landing the job you want after graduation!